Funny Face was filmed in 1957 and it is gloriously mid century. The first few minutes are so eye catching and filled with colour that they are a must-see for the mid-mod enthusiast. These doors attracted me instantly and I decided to put my crochet down for a bit. The storyline basically involves a fashion magazine wanting to be innovative and unique - trendsetting, I suppose. I love the floor to ceiling windows and long couch scattered with colourful pillows but could do without the fancy-legged table, if I'm honest. Wanting their model to appear intellectual, they seek out an intellectual backdrop and find a bookshop where Audrey Hepburn's character works. The model was played by Dovima, who was apparently a top fashion model of the day. For some unknown reason, a kiss from an old man (Astaire) causes her to fall instantly in love. 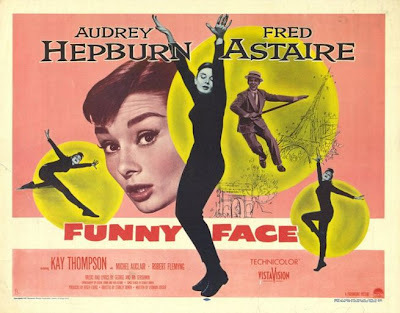 Now, Audrey may have been the 'funny face' but it was Astaire's that I found ridiculous. I understand he was a great dancer but surely, if he was so great, he could've trained a younger, more attractive man for the lead role. I get that movies don't need to be realistic but Fred Astaire certainly isn't my idea of a fantasy either. So anyway, they decide good ol' Auds is the kind of gal they need to represent their magazine and Fred's dashing good looks (ahem) convince her to head off to Paris with them for some photo shoot and fashion show. Cue musical number involving the sights of Paris and Audrey sporting an adorable ponytail. There are scenes inside a kind of french Beatnik cafe where Audrey dances her little heart out with some French strangers - one of whom comes complete with stereotypical striped shirt - love it. A kind of beatnik leader inadvertently causes tension between our two leads - perhaps it was the beard? Fred and the magazine lady go to the cafe to 'recapture' their reluctant model in the funkiest little car and hippest beatnik disguises (Clearly it was the beard). I won't spoil the ending although I'm sure you could guess it, I'll just leave you with another adorable ponytail shot. Ha ha Frank Sinatra was thought of as a sweetheart of the day, maybe a tad long in the tooth by that time, but maybe a Sean Connery-type situation. Frank Sinatra I can understand - did you mean Fred Astaire? They do the same thing with news readers too - it bugs me in all places - grrr. I love this post! While Funny Face is not one of my favorite movies, (Audrey or otherwise) I will agree that the set had some fun MCM design.